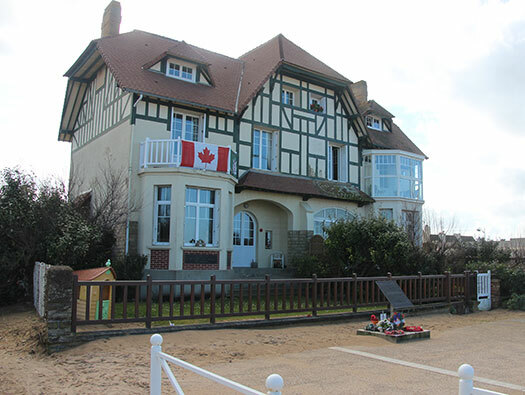 Wn28 Bernières-sur-Mer, K.V.U. Gruppe Courceulles. 1 x U type Ringstand for a Pz.T. FT-M.G.311(f). 1 x Gr. W ringstand. 3 x 8.14cm Gr.W.278(f) mortar. U type Ringstand for a Pz.T. FT-M.G.311(f). 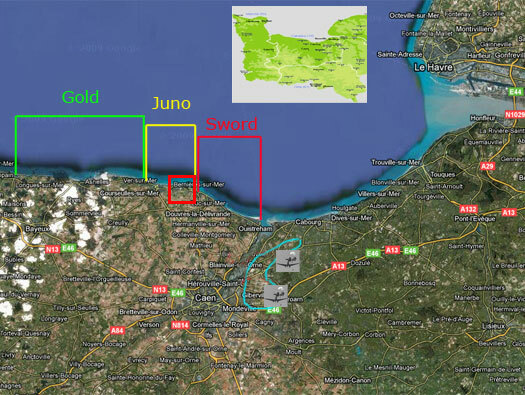 All the Wn defences along this coast. 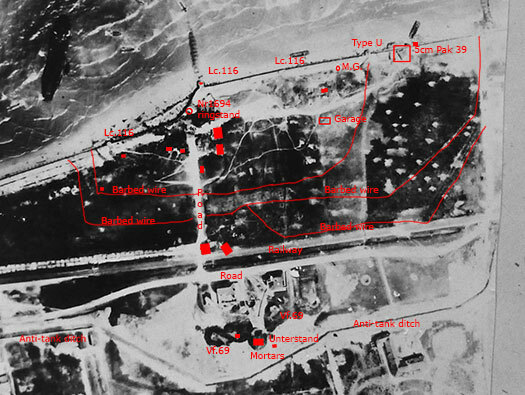 Plan showing a front row of defence positions backed by two and three strands of barbed wire and covering the rear three mortars and a long anti-tank ditch..
A better quality air photo..
A blue painted high flying Spitfire of the Photo Reconnaissance Unit PRU..
WAAF's looking over air photos. 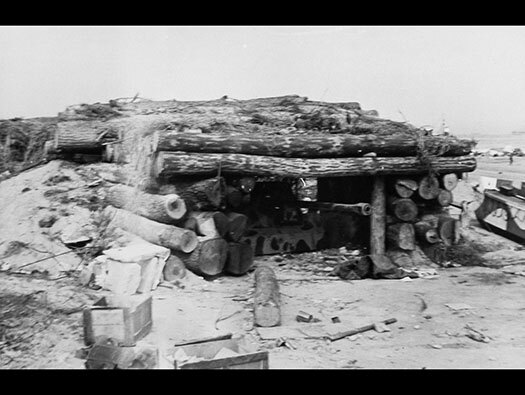 Possibly the first house liberated by the Canadian army. 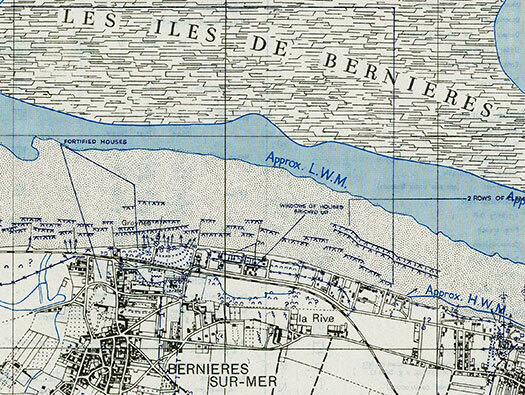 Wn28 Bernières-sur-Mer Plan of minefields and defences. 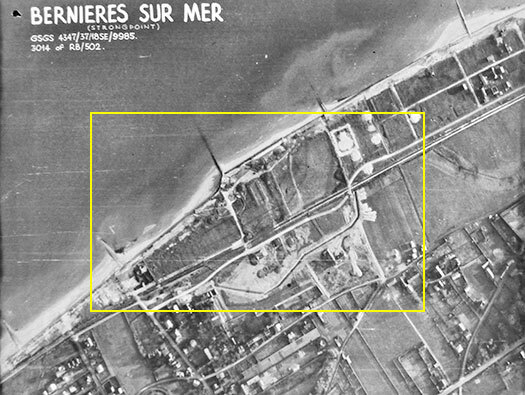 Mf.58 and Mf.57 the two minefields to left and right of Wn28. .
A very good picture of the existing beach defences around Bernières. 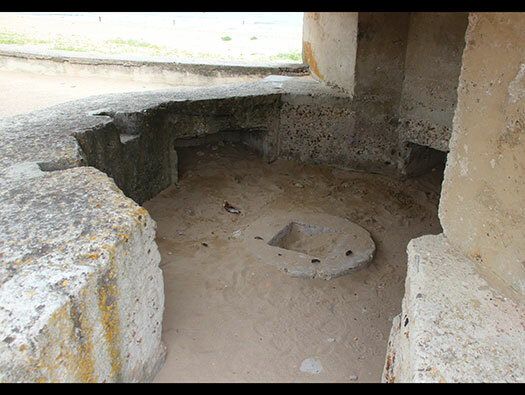 Walking in a clockwise direction, this is the first bunker an Lc.116 Tobruk, now only half its original size. You can see the way the rear half has been removed. 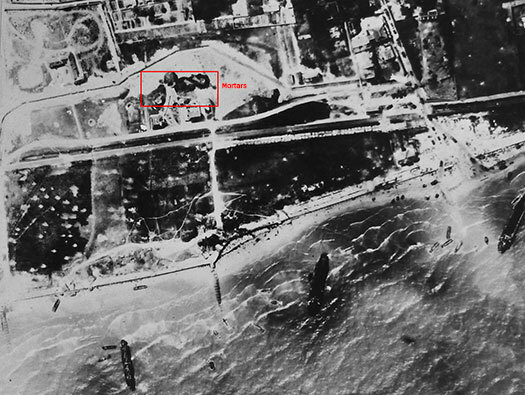 M.G.08 machine gun firing down the beach. 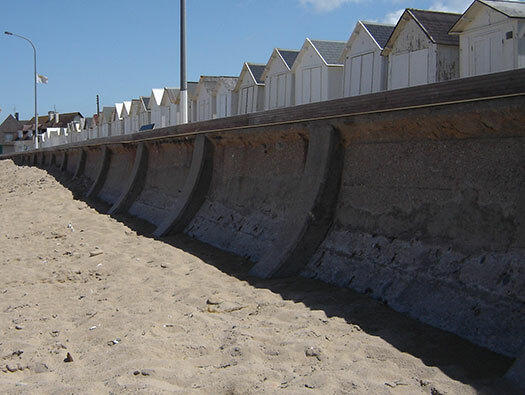 Protection added to the seaward side and it could only fire down one side of the beach. Landed The Queens Own Rifles Of Canada. 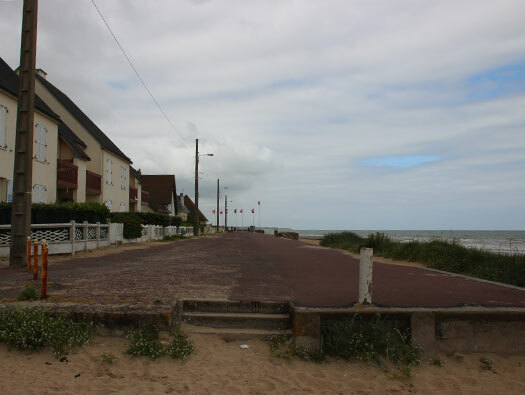 The view down the beach where it fired. 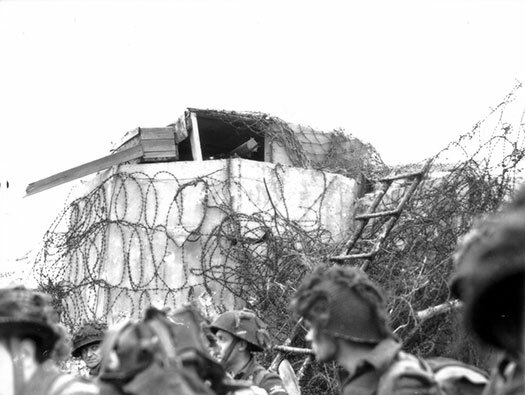 I think this is the same Lc.116 just after the landings with Canadian Infantry sheltering under the sea wall and an aluminium ladder used to clime the sea wall. 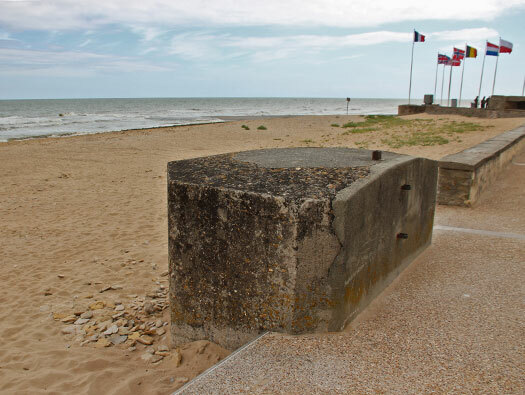 It looks as though it has a MG.08 only able to fire down the beach and not out to sea as that side has a wooden and probably sand box to absorb bullets. 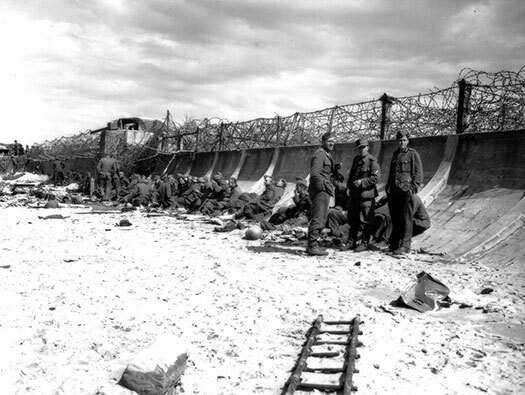 Another picture taken at a different angle and you can see how the barbed wire has been used to make an infantry attack very hard..
How it looked post war before the rear was removed to make the promenade larger. 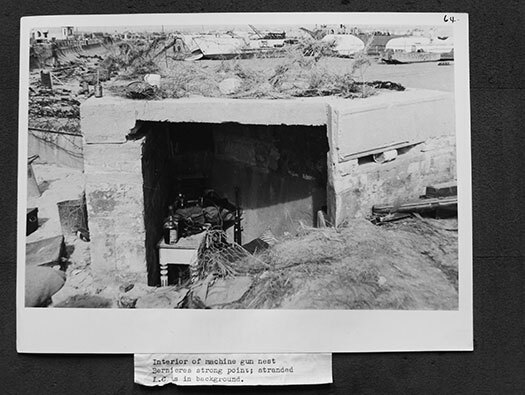 Picture taken from the 5cm gun position. 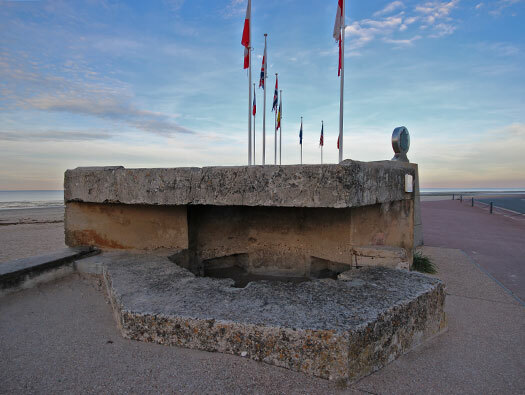 This was an open ringstand that as the war progressed and the threat of a landing became reality extra cover was needed from the sea and a wall was built and a cap put over the top. 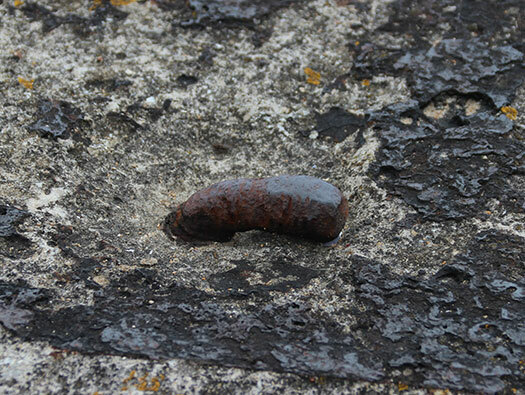 This gun survived the landings and was removed later. Elevation view of this style of emplacement. The gun looks as though it was captured and not destroyed. The machine guns hit the Canadians as they landed, belt fed MG.09´s, MG.34´s,MG.42´s, 8.14cm mortars, a 5cm KwK Pak and 5cm Pak A/T gun that I believe took out six Shermanâ€™s. Looking into the ringstand. 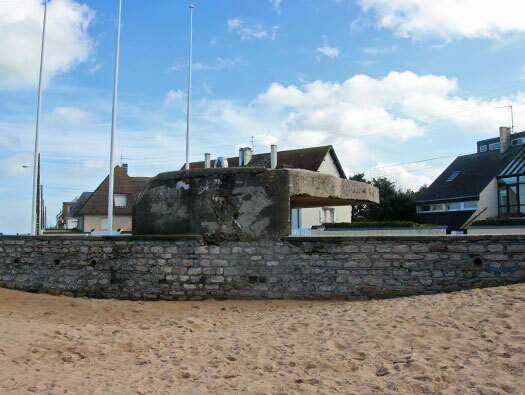 Quite a strong front wall and smaller cap over the top holding a 5cm KwK gun. Camouflage on the concrete lip. Camouflage, steel supports and boxes filled with sand to help add protection but I am not sure if the gun can traverse or not?? The front wall does not look too damaged. 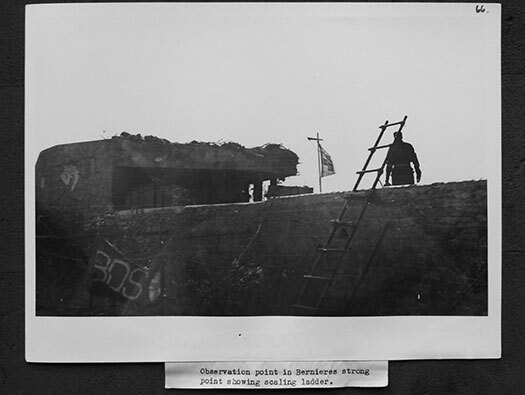 Almost the same angle photo as the one above and showing a scaling ladder used to climb the sea wall. Ringstand base where the gun fitted in and ammunition niches around the outside. The guns mounting, then the guns body would fit on the top. Nr1694 open emplacement which is the base of this emplacement and then the wall and lid is built over it. 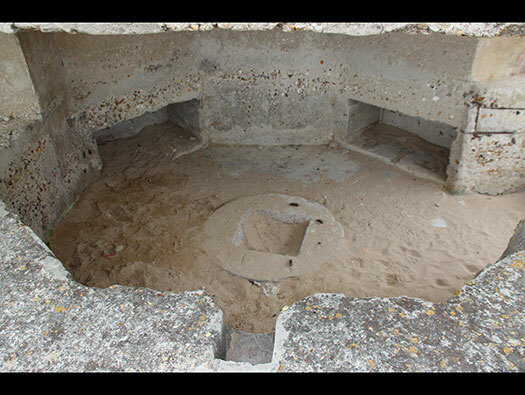 Ammunition boxes may have fitted nicely inside the niches. 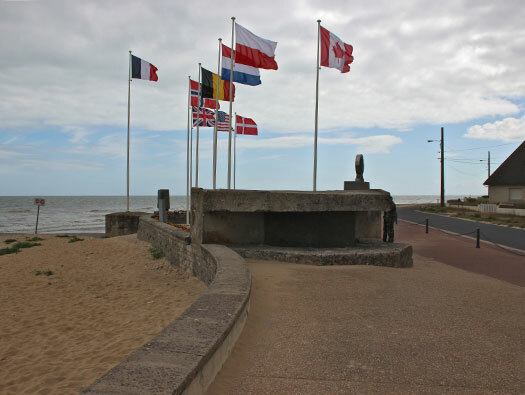 A group of army intelligence experts visited the beaches and photographed what they felt was important. 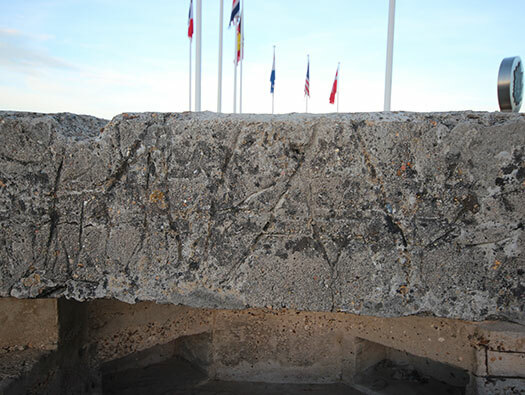 This has been completely removed but was between the Nr.1694 ringstand and the Lc.116 Tobruk. A table removed from a house also bottles. 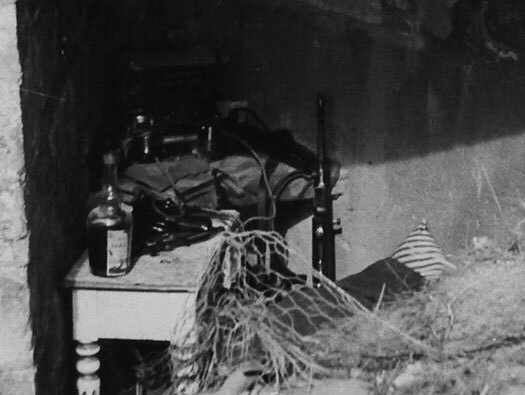 A table removed from a house also bottles and looking closer a few pistols, a sub-machine gun and a field telephone. This Lc.116 Tobruk was slightly modified to make the crew room bigger. 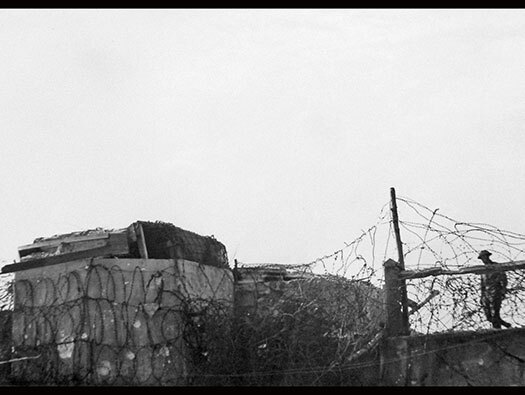 Not a very good picture later on with the Modified Tobruk and the guard post. Probably an M.G.34 on a heavy tripod. An FT turret with an M.G.311F machine gun. U type Ringstand for a Pz.T. FT-M.G.311(f). Notre the barbed wire and screw pickets attached to the hooks on the U - Ringstand. One of the threads to hold down the turret mounting. This U shaped ringstand still gas its turret ring bolted on. 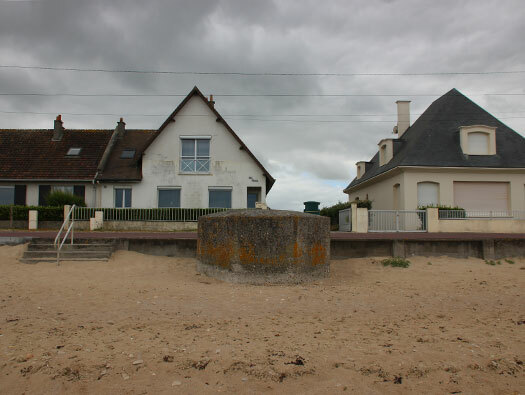 Wn28 Bernières-sur-Mer U type Ringstand for a Pz.T. FT-M.G.311(f). 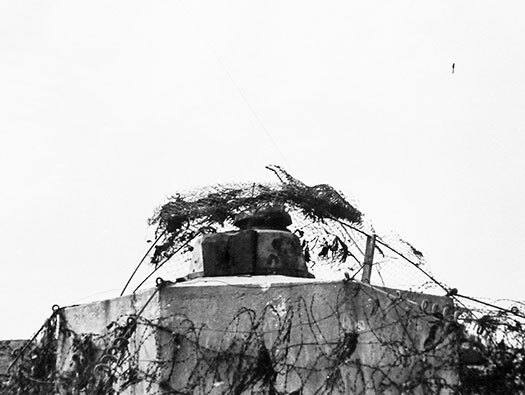 This is a very interesting picture, after D-Day with the barbed wire supports cut down and the U type Ringstand for a Pz.T. FT-M.G.311(f). Another post war picture of this ringstand. 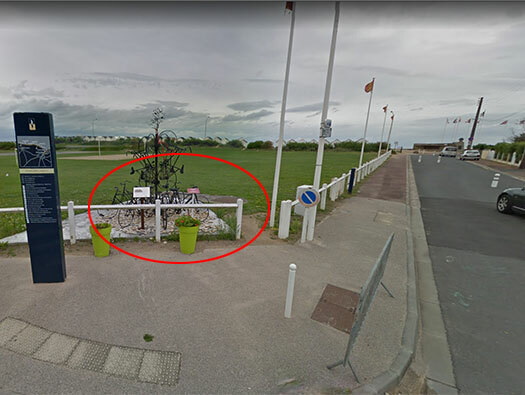 It shows a stone/concrete trench leading to the ringstand and a covered area for a second person to shelter. U type Ringstand for a Pz.T. FT-M.G.311(f). 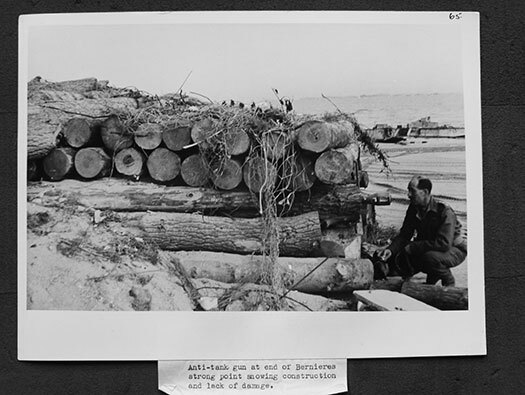 Here was a field bunker made from logs to protect a 5cm Pak 38 anti-tank gun. 5cm Pak anti - tank gun. This would have been blocked off and barbed wired in. 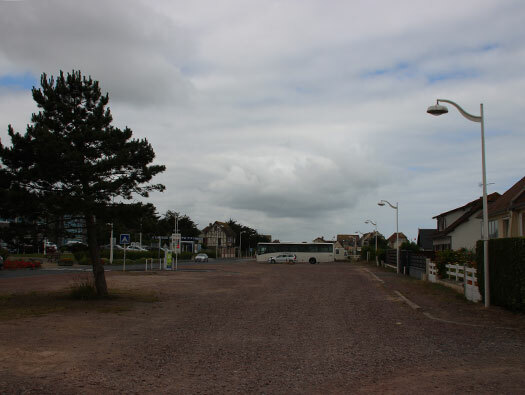 To the left of the bus you can see the petrol station, this I believe was here in WW2. There were two Vf.69 mortar ringstands well able to hit targets out to sea and on the beach and also a all round defence. 3 x 8.14cm Gr.W.278(f) mortars. 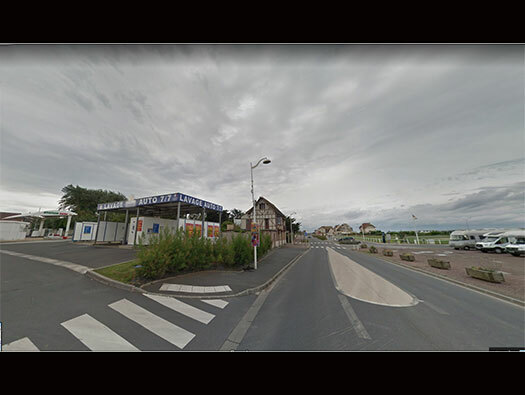 I have found out from Jean-Pierre that there were mortar Tobruks where the petrol station has now been built. Behind was an anti-tank ditch. 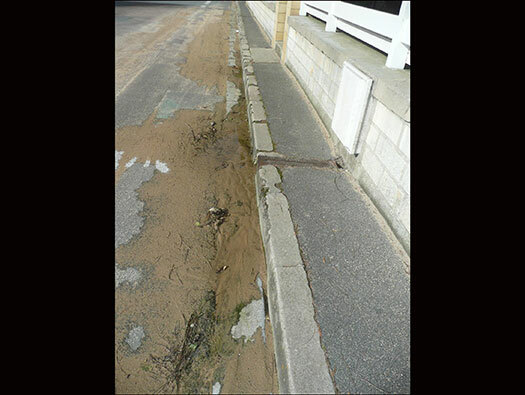 The anti-tank ditch at Courseulles. The last Lc.116 ringstand I completely missed it behind the bicycle. Getting old. In this patch of land were two Unterstands of some type, probably small concrete bunkers of no determined design to hold about six men or ammunition. And back to the house again. 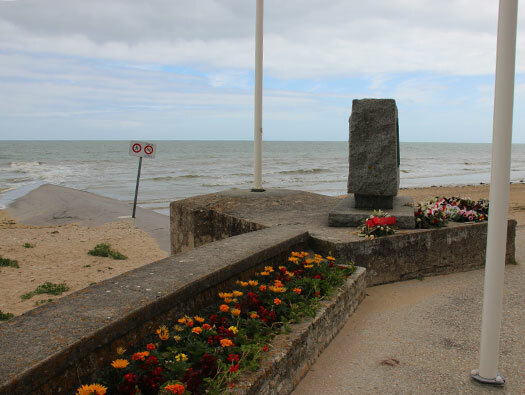 The problem here was that Les Iles De Bernières a shallow area of water that meant that the landing time had to be slightly adjusted to allow the ships to sail over the reef. 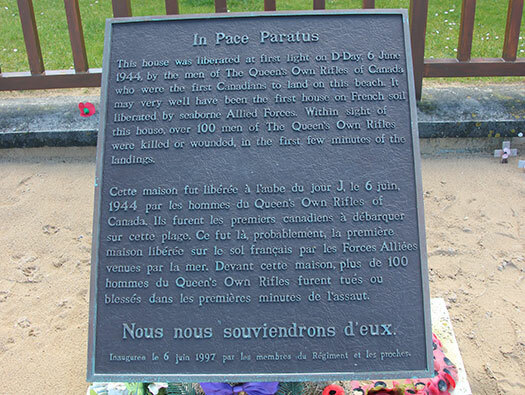 Queen's Own Rifles in the centre at Bernières (Nan White beach) near Bernières at 8:05. The enemy fortifications on the 'Nan White' sector had been barely dented by the preliminary bombardment. 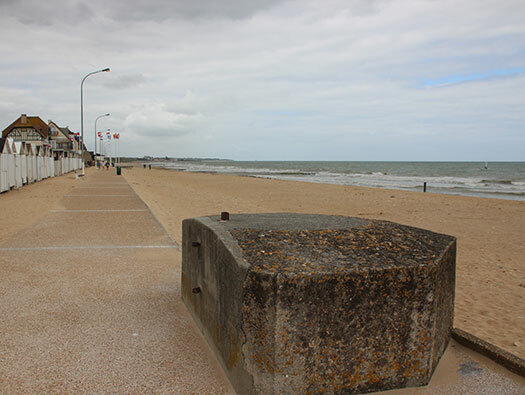 The DD tanks were supposed to 'swim' in ahead of the infantry to diminish German resistance but were forced by high waves to land after them. 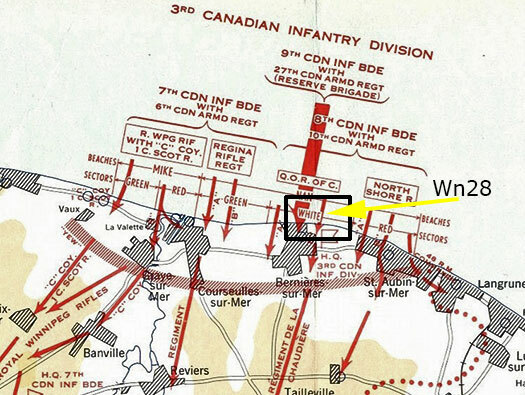 When the QOR regiment stormed the beaches, they received the worst battering of any Canadian unit on D-Day. ‘A’ Company landed to the west of BerniÃ¨res. Charlie Martin, Company Sergeant-Major, ‘A’ Company described the landing in his book Battle Diary: "As we moved farther from the mother ship and closer to shore, it came as a shock to realize that the assault fleet was disappearing from view. 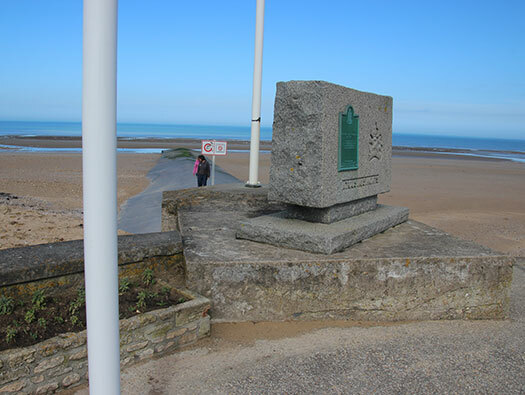 Suddenly there was just us and an awful lot of ocean, or English Channel if you prefer. 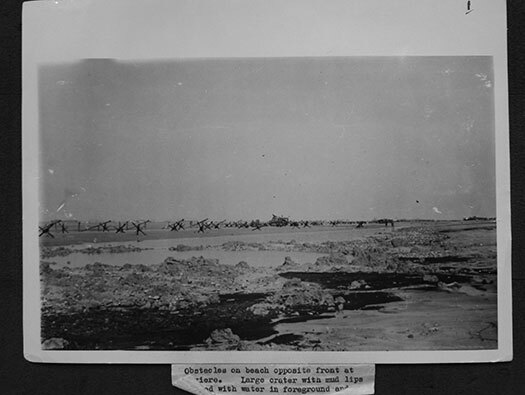 All that remained within sight was our own fleet of ten assault craft, moving abreast in the early-morning silence in a gradually extending line facing the shore, the ‘A’ Company boats on the right and the B Company boats on the left. 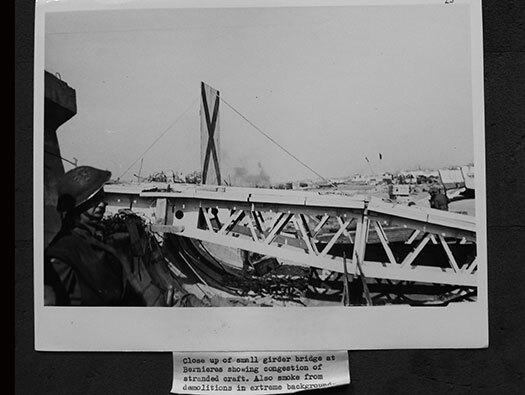 "The moment the ramp came down, heavy machine-gun fire broke out from somewhere back of the seawall. Mortars were dropping all over the beach. The men rose, starboard line turning right, port turning left. I said to Jack, across from me, and to everyone:" "Move! Fast! Don't stop for anything. Go! Go! Go!" We raced down the ramp, Jack and I side by side, the men closely following. We fanned out as fast as we could, heading for that sea wall. 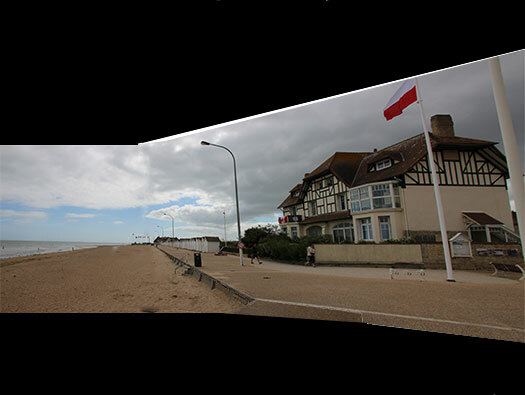 None of us really grasped at that point, spread across such a large beach front, just how thin on the ground we were. Each of the ten boatloads had become an independent fighting unit." 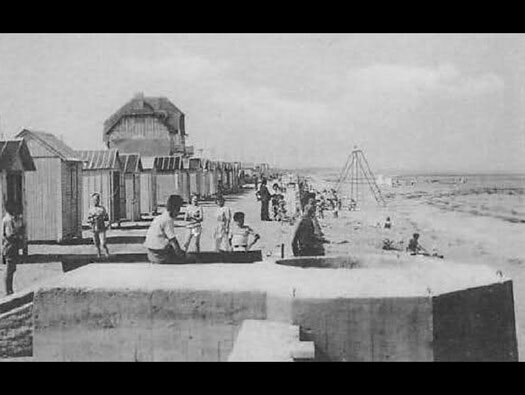 "Our part of the beach was clear but there were mines buried in the sand. On the dead run you just chose the path that looked best. Bert Shepard, Bill Bettridge and I were running at top speed and firing from the hip. To our left we spotted a small gap in the wall. They had placed a belt-fed machine gun there as part of the defence and only one man was on it. We knew from our training that you cannot be on the move and fire accurately at the same time. If you stop you become a target. In any case, Bill did stop for a split second. He took his aim and that seemed to be the bullet that took the gunner out, although Bert and I were firing too. We got to the wall and over it, then raced across the railway line." 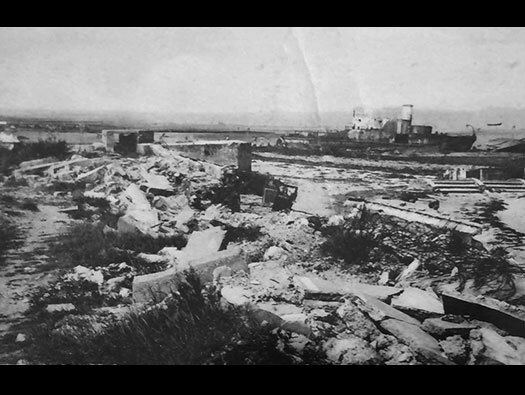 ‘A’ Company was hit by heavy machine gun fire and heavy mortar fire. 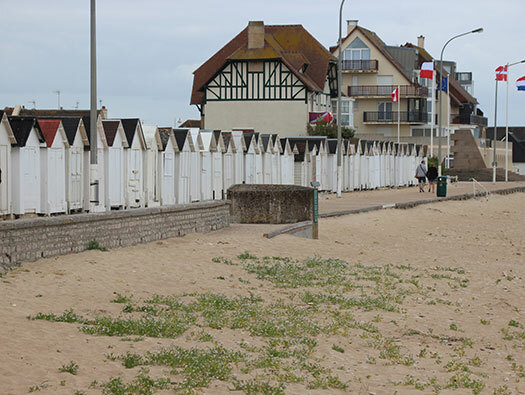 They got off the beach quickly and began clearing the town of Bernières. 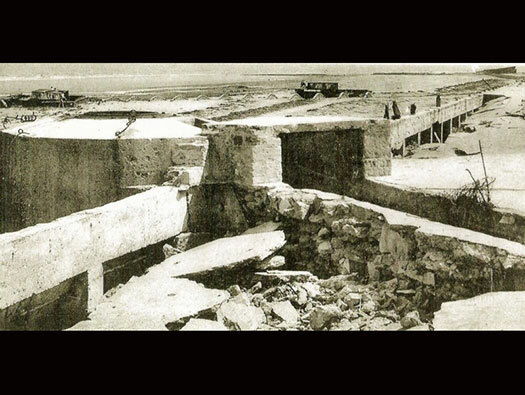 'B' Company landed 250 yards east of its objective, directly in front of an enemy pill-box which inflicted 65 casualties within the first minutes. 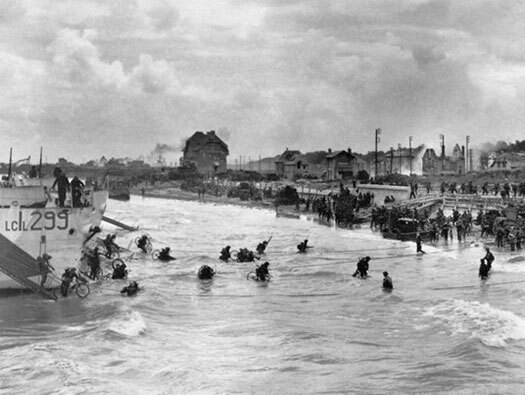 The assault depended on the resolve and courage of the remaining men to race across the beach to the seawall with no cover in between. 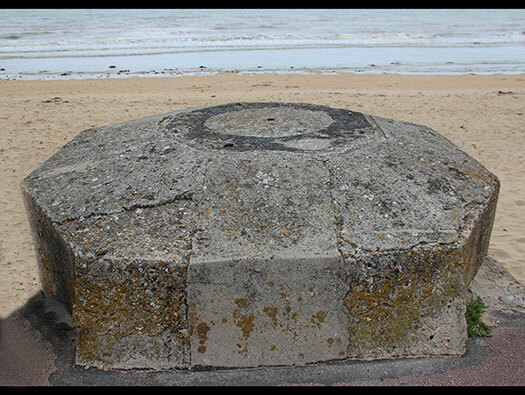 Doug Hester, ‘B’ Company: "Then we saw the five pillboxes on top of the sea-wall. These were our first objective. About 500 yards out, they had us in their sites of their small arms and began shooting. When the craft got into shallower water, the Royal Marines lowered the door. The three in front of me including Doug Reed were hit and killed. By luck I jumped out between bursts into their rising blood. Cold and soaking wet, I caught up to Gibby...the first burst went through his back pack. He turned his head grinning at me and said, "that was close, Dougie. "...the next burst killed him." 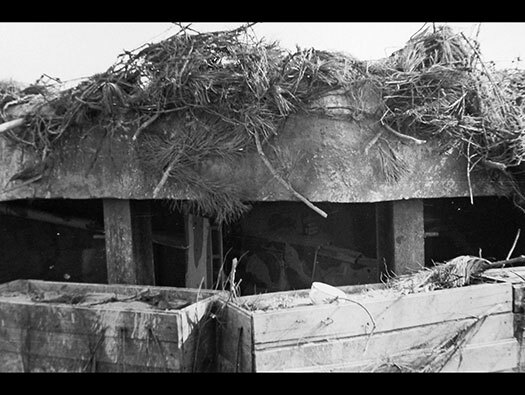 In a mad dash three riflemen reached the main pillbox. 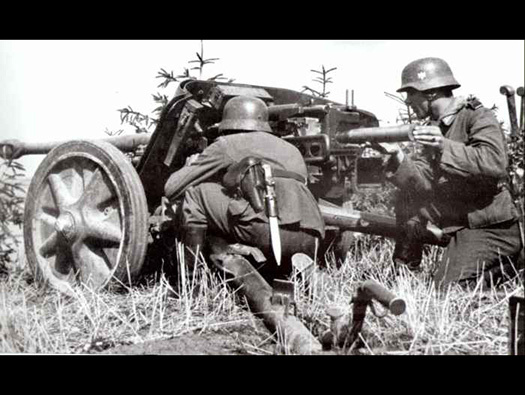 Using their grenades and Sten-guns, and firing through the gun slits, they destroyed the defenders within. 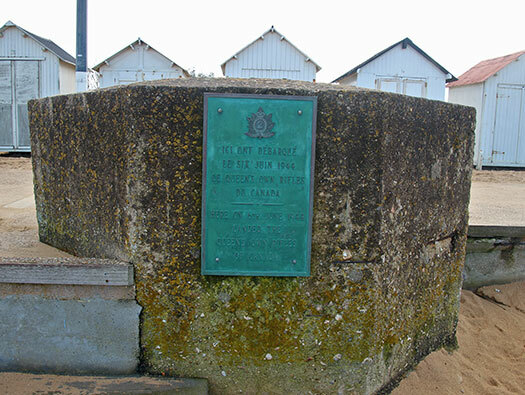 Lieutenant Herbert, Lance-Corporal Tessier and Riflemen Chicosk were awarded medals for their attack on the main pillbox. 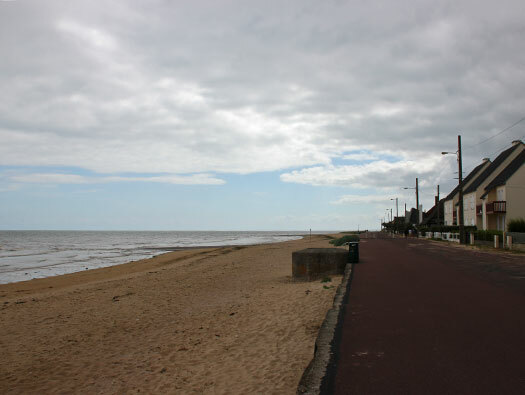 The remaining riflemen in ‘B’ Company outflanked the positions, broke through the beach defences and moved into the town. 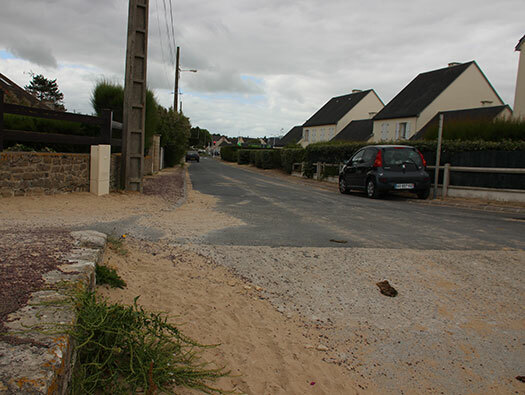 ‘A’ Company came under heavy machine gun fire as they moved into the town of Bernières. They advanced using fire and movement. Several soldiers would stay firm, providing covering fire while the others would move up to the front. Once they were in position and ready with covering fire, the others would come up. 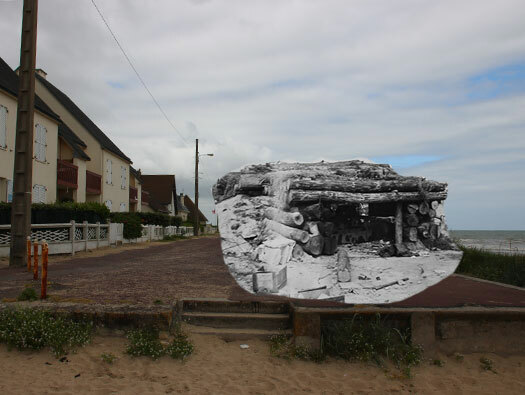 By 8:45, ‘A’ Company had taken the road through the village at its southwest point. 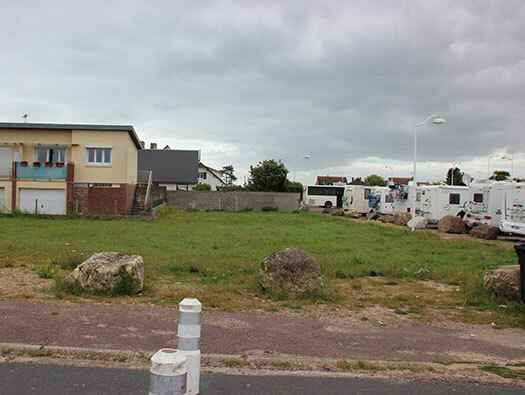 ‘B’ company also advanced into the town and by 9:00 BerniÃ¨res was secured. 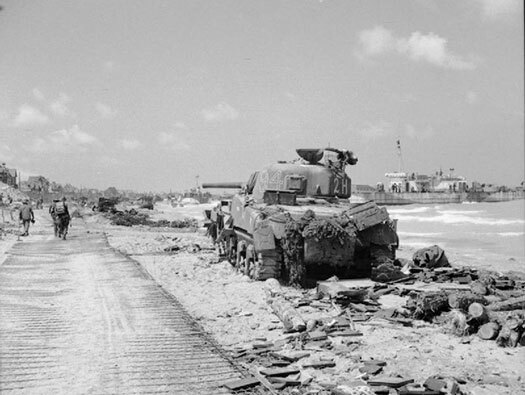 The Fort Garry Horse DD tanks landed shortly after the infantry and fired steadily at the German pillboxes and strong-points from their beach positions. 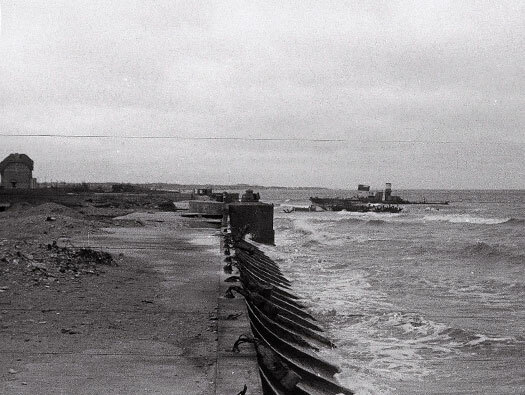 After the AVRE's were able to clear a beach exit, the Fort Garry tanks moved up from the beach and into the town around 9:30. 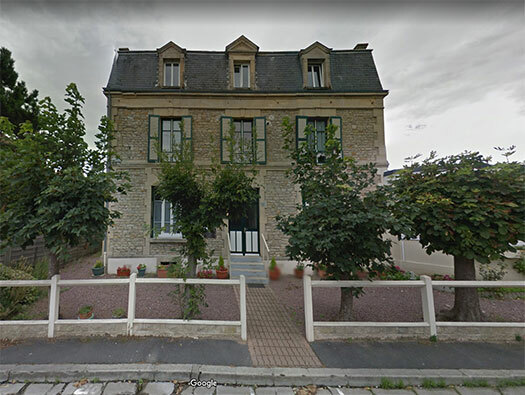 The QOR moved to their 'Forming Up Place', reassembled into groups and moved out with the Fort Garry Horse tanks south towards Anguerny seven miles up the road. 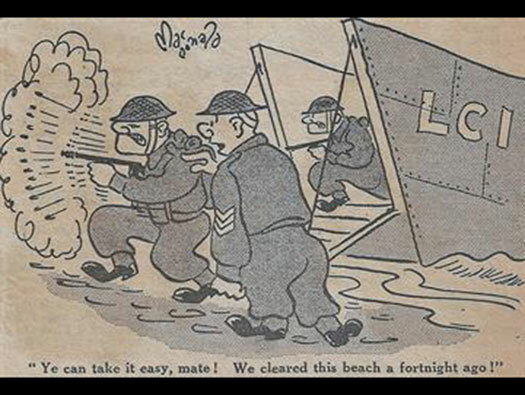 The Queen's Own reserve companies ‘C’ and ‘D’ landed at 8:45 and suffered heavy casualties when half of their LCA´s hit underwater mines on the run in. ‘C’ and ‘D’ Companies advanced making a flanking movement on their objective. 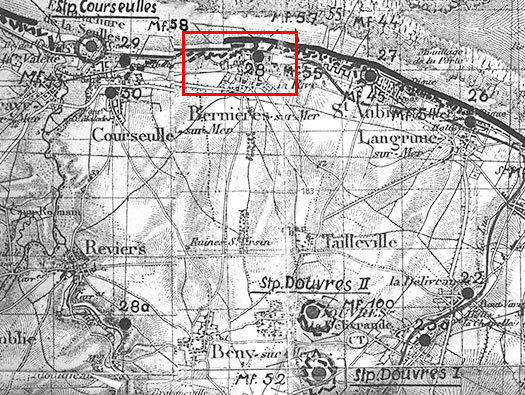 Early in the afternoon, ‘C’ and ‘B’ companies captured Anguerny. ‘D’ Company advanced to take the village of Anisy. 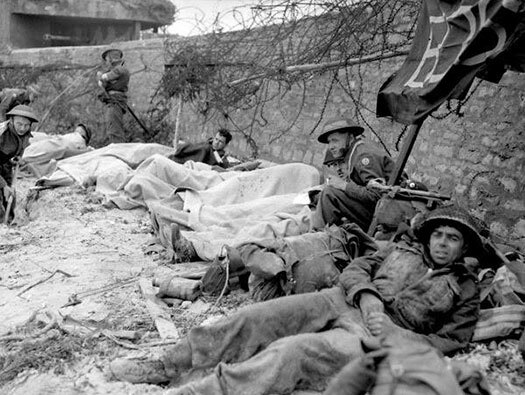 The Queen's Own Rifles had the highest casualties among the Canadian regiments with 143 killed, wounded or captured. 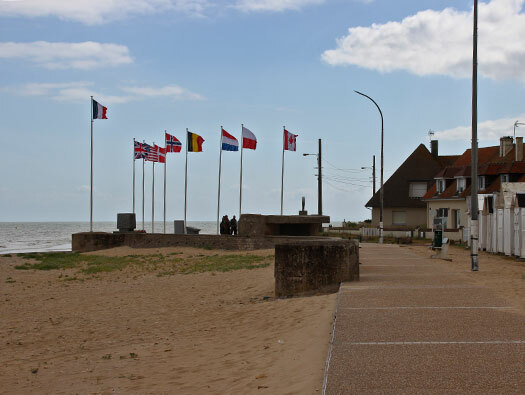 Despite the painful price, the QOR had succeeded in securing its D-Day objective seven miles inland. 2 x Vf.69 mortar Tobruk plan. 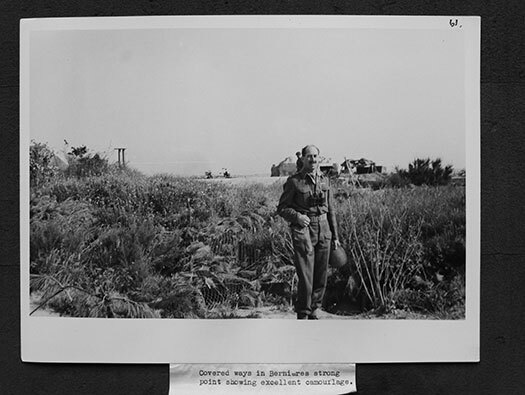 1 x 8.14cm mortar in field position. A knocked out Sherman tank 94 2H and a road way made from Sommerfeld tracking. Infantry landing from LCIL299. 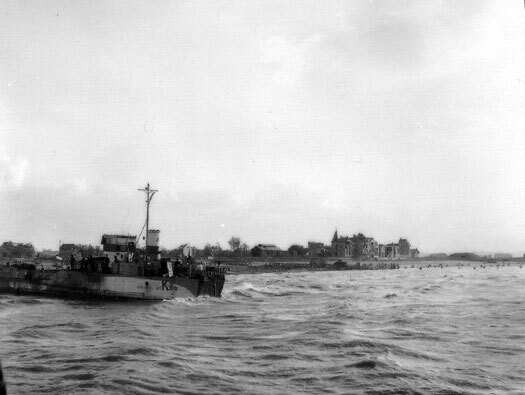 (Landing Ship Infantry Large). 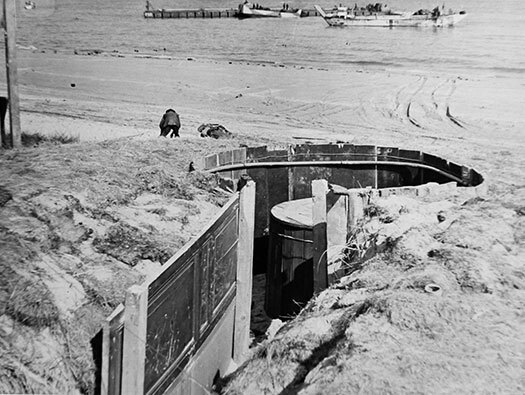 A tank bridge has been laid over the sea wall. Churchill AVRE with Small Box Girder Bridge. 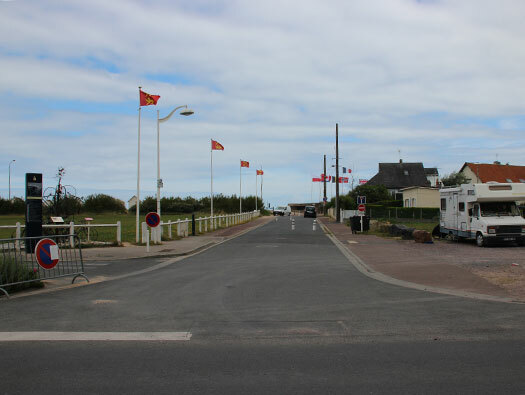 Rue du "Régiment de la Chaudière"
the church to disperse then towards Basly, Bény, Douvres, Villon-les-bushes, Authie, Carpiquet where they to continue the fight. 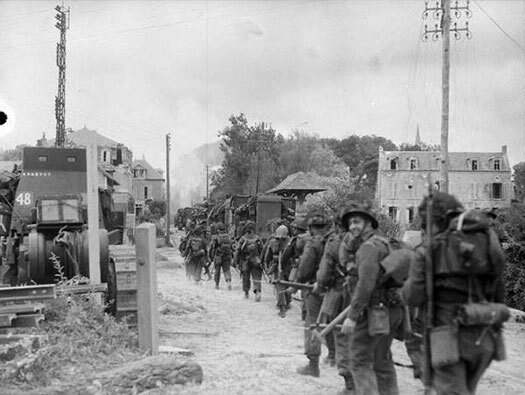 Infantrymen of Le Régiment de la Chaudière-moving-through-BerniÃ¨res-sur-Mer on the now Rue du "Régiment de la Chaudière". 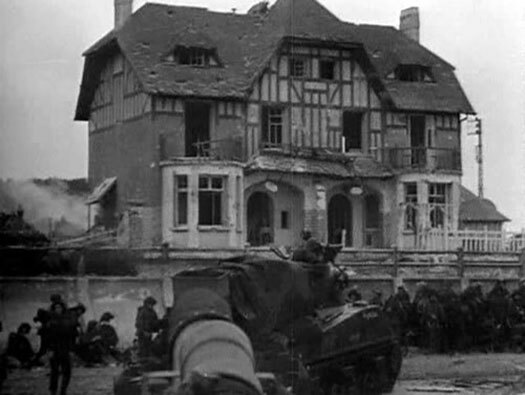 Sherman tanks driving through a small French village. 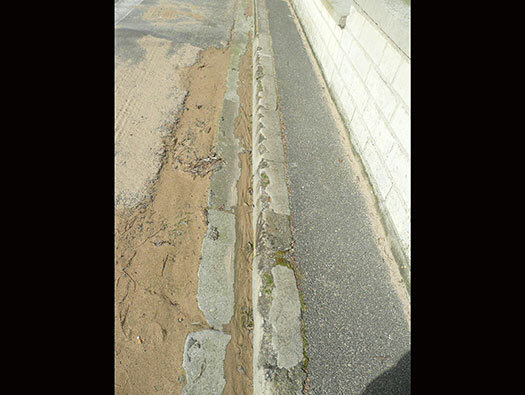 The damage done to the curb stones along the Rue du "Régiment de la Chaudière". The first general headquarters of Canadian and British photojournalists. 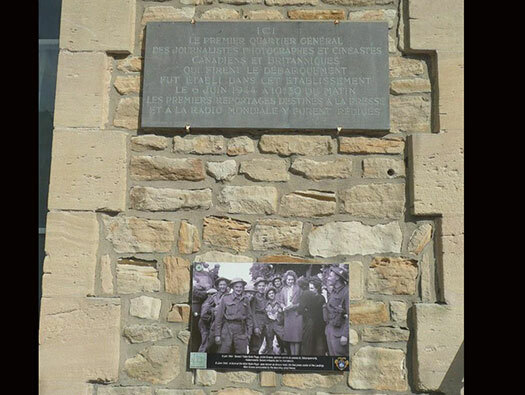 Here the first general headquarters of Canadian and British photojournalists and filmmakers who made the landing was established in this establishment on June 6, 1944, at 10:30 in the morning, the first reports for the press and world radio were kept there.